Hello! I am a Tax Accountant, Akirako Kimura (@kimutax). I’m writing this blog to introduce the ways of controlling your time, action and money. ※I participate in these blog rankings below. 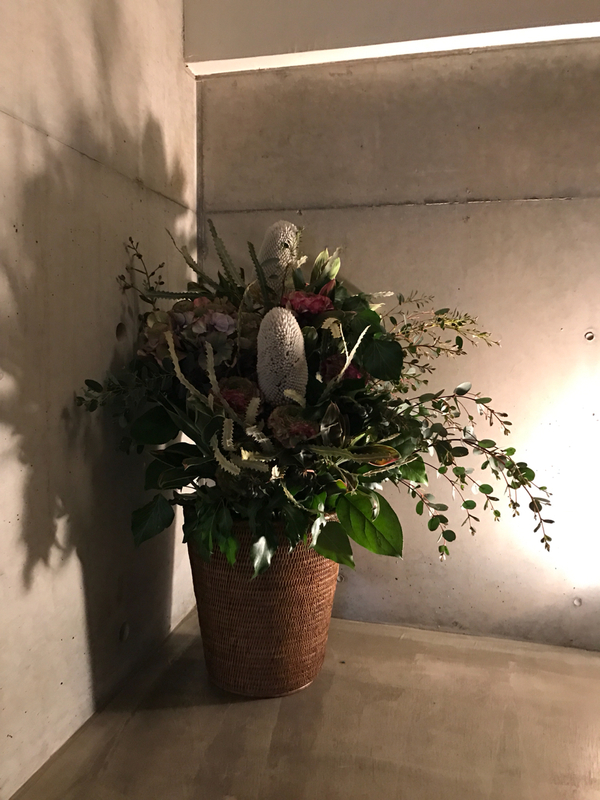 Let me introduce you what kind of flowers are used for this arrangement! 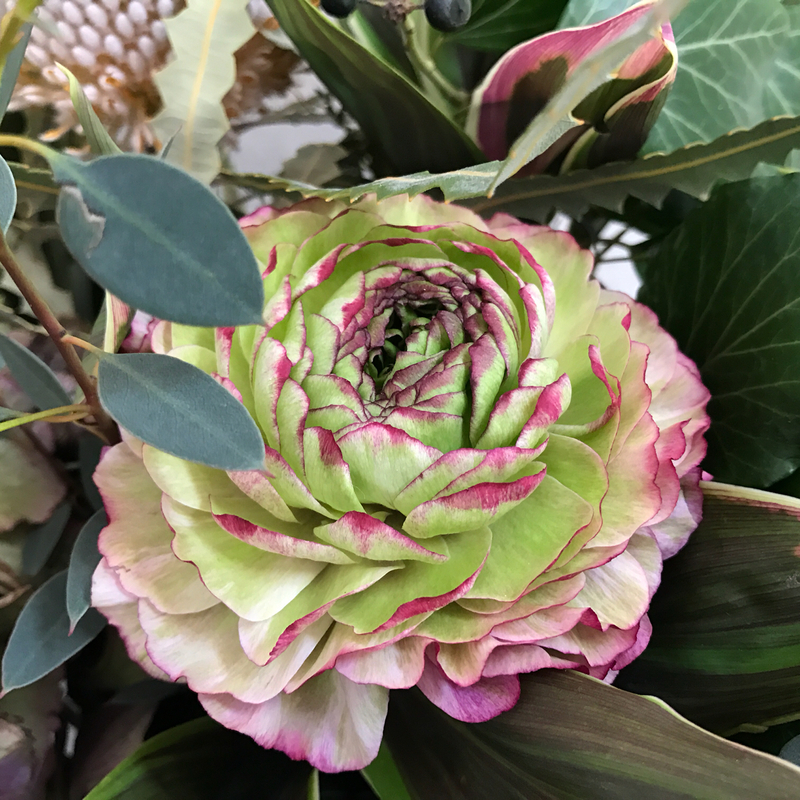 Talking about RANUNCULUS, you probably imagine the white or light colored fluffy flower like that arrangement though, here’s one with the interesting tone of colors. Made of light green and dark pink on tip of the petals. It’s a unique flower, as its form making it looks like a vegetable. This week’s arrangement is unified in shabby and antique atmosphere overall. 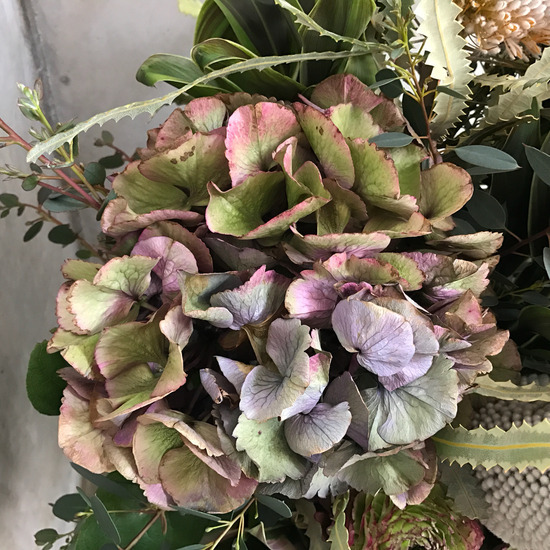 And the HYDRANGEA, being dull green and purple color mixed, is enhancing the atmosphere. 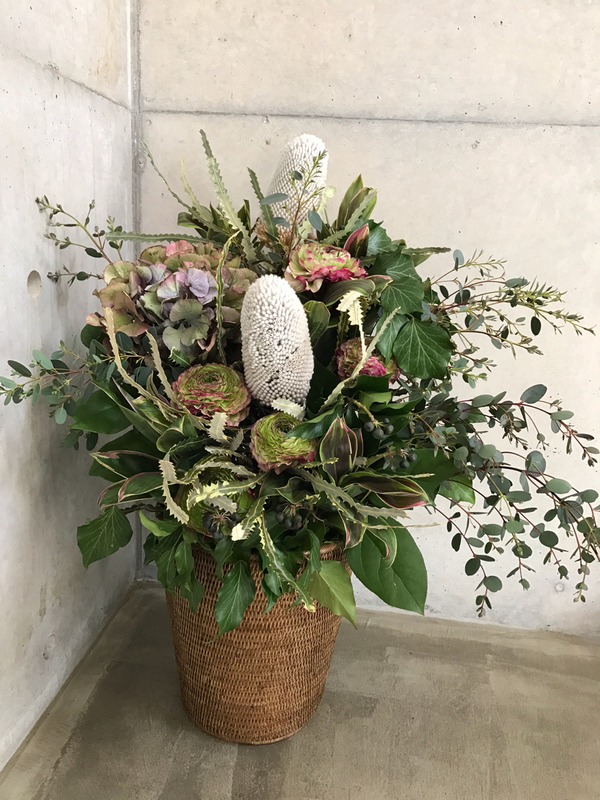 After enjoying this arrangement, why don’t you make dried flower of HYDRANGEA? You should also find a good character coming out of it. It’s very easy to make dried flower. You just lay the flowers on the newspaper until they get dry naturally. There is no doubt that the conspicuous look in this arrangement is BANKSIA. And it’s the first time for me to see it too! 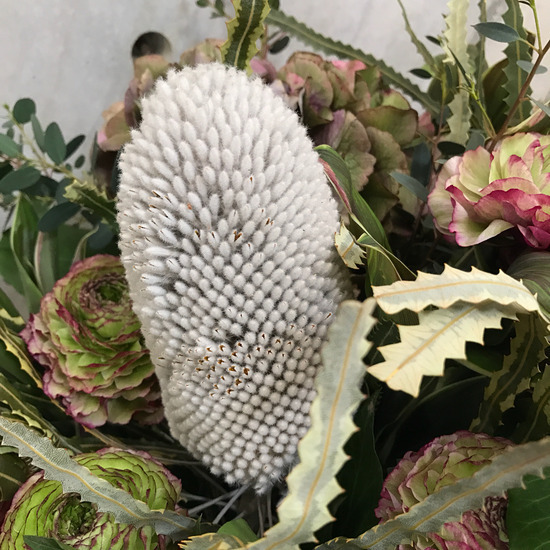 BANKSIA is one of “the native flowers”. 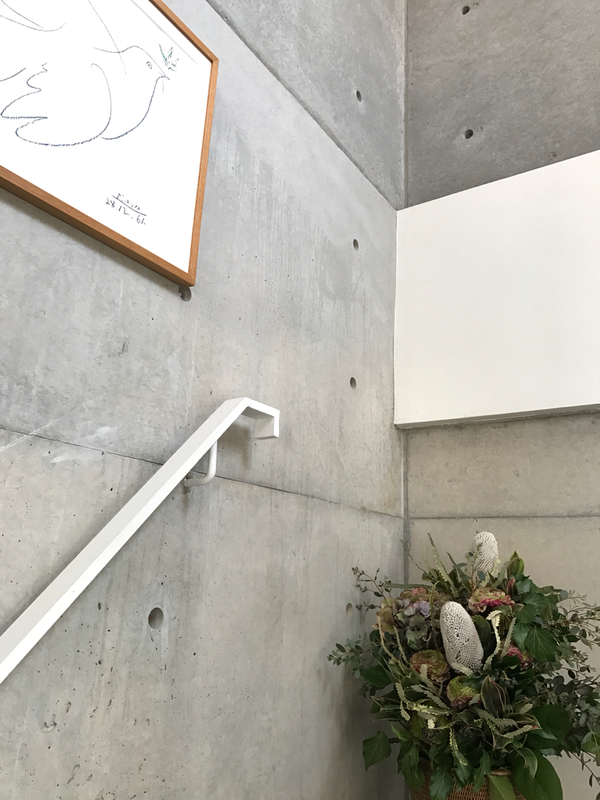 “The native flowers” are the ones in Southern Hemisphere like Australia and New Zealand, and they’re usually large and have an impact in form. Also, most of the native flowers last long, strong in summer heat and easy to manage! A little strange and distinctive form though, if you arrange it with branches wildly, it will even fit in rooms for males stylishly, I think. It stands in contrast to “last week’s flowers”. Flowers have the power to change the atmosphere of office completely. The arrangement which is unified wholly in green color like this time matches the interior and other house plants, and I like it very much. ▼To tell you the truth, the Rattan vase I’m using for my office is originally a trash box, ha-ha. Oh, I placed a saucer under the pot, so it’s waterproofed! But it doesn’t look strange to be used as a vase, does it? On top of that, it fits into any kinds of flower arrangement. It’s really a brilliant “former trash box”. ※This is my second book. Crossed the sea to Korea, it’s translated and published also! It has also released as audio books since February 11, 2017. Now I’m in the middle of preparing to publish my third book this year. Copyright (C) 2005-2017 木村税務会計事務所 All rights reserved.